Stylish Villa With Private Pool in lovely location! Stunning 3 beds, 2 baths super deluxe villa on large plot with private pool & super sea views. Lounge comprises of lovely pastel green sofas, Sat TV & DVD player, air-con throughout, super dining table & chairs to seat 6 people, fully equipped kitchen, BBQ, outside dining area, 8 x 4mtr private kidney shaped pool, landscaped gardens, car port, total privacy, doorstep to 3 prestigious golf courses and only 12 minutes drive to Paphos town! Fab villa in peaceful location......one not to be missed! En-suite bathroom to master bedroom is large with a shower, vanity unit, basin and wc with natural light. Large family bathroom with full bath (shower over the bath), basin and WC. With natural light. WC on the ground floor to service downstairs area. Bath towels only, please bring pool towels with you. This kitchen is a chefs dream. Its modern appliances include fridge/freezer,oven, hob, blender, dishwasher and washing machine, quality designer pots and pans to make your cooking experience an event.Your on holiday enjoy it! One of the best kept secrets in Cyprus is the availability of skiing. You can ski from the start of January to the end of March in Troodos Mountains. The Troodos Mountains are about one and a half hours drive from the villa. Where you can ski in the mountains & swim in the sea on the same day!! For the golfer the villa is situated just 5 mins drive to Secret Valley Golf Course, just 7 minutes drive from the Aphrodite Hills Golf Club, Hotel and Leisure complex & 20 minutes to Tsada Golf Club. The Secret Valley Golf Club is a challenging 5,900m par 71 course with panoramic sea views. Aphrodite Hills Golf Club is an even more challenging 6200m par 72 course and is set high in the hills. All these courses are playable mostly in sunshine all year round. The new Nick Faldo course Elea is also just 10 mins drive to Yeroskipou. Fab private 8x4 mtr kidney shaped pool with roman steps for easy access. Villa Luna is a modern very stylish villa, situated in an elevated position with beautiful views to Paphos coastline. Just a few minutes from the historical sites and tavernas at Kouklia village, Mandria Village & just 15 minutes to local beaches at Pissouri bay. With only 10 minutes drive from Paphos Airport and 20 minutes to the bustling Paphos centre as well as its close proximity to 3 championship golf courses, the villa is ideal for holidays all year round. Outside: Private, landscaped garden with patio/BBQ area for outside dining, super 8x4mtr private kidney shaped pool, car port, total privacy. Sun loungers, BBQ, dining table & chairs, parasols, grand! Cleaning / Towels / Linen / Maid service: The villa is supplied with bath towels and bed linen for up to 6 people. The villa will be serviced with a mid-stay laundry change for bookings over 12 day periods only, extra services (if required) can be arranged and paid for directly with the appointed Property Manager. Villa Luna was modern and well presented. It comprised of 3 bedrooms, all with a small balcony and each had stunning views. The villa was well equipped providing everything you need for your stay. The booking transaction was easy and communication with Jane helpful. The villa was private around the pool area with well established trees and hibiscus adorning the garden. A car is necessary for the duration of your stay so ensure you factor this in when booking. 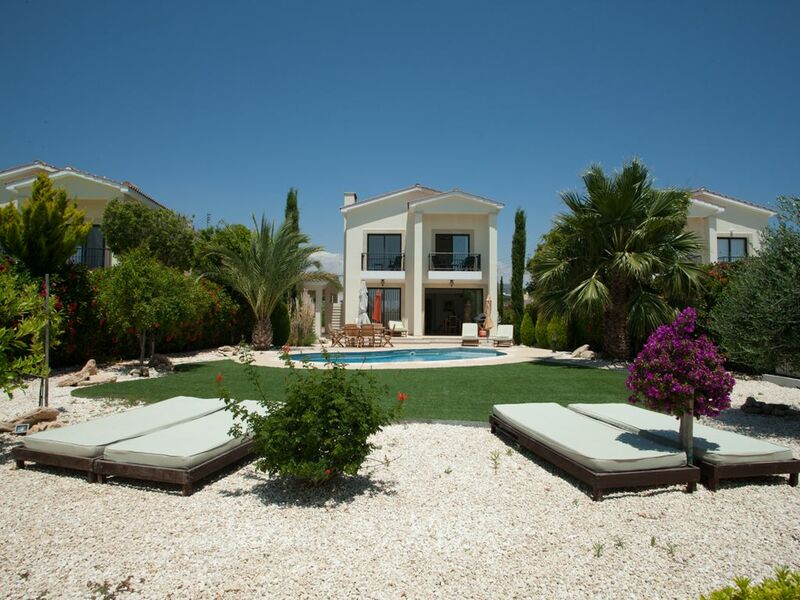 An amazing villa with everything you need to cater for a fantastic holiday. All the service staff were very friendly and gave us some helpful advice. lovely location will be going back one day. Thanks again for a most memorable time away. Beautiful and clean property in a very nice location. Pool was perfect for our 3 children. Helen was very helpful on our arrival,sorting out a broken hair dryer. Smooth booking through Jane Villas website. Just back from a fabulous stay at Villa Luna with my family. The villa has everything you could need and set in a quiet area, perfect for chilling out, but close enough to shops and restaurants with the use of a car, so not isolated. Would definitely consider returning in the future. We arrived at the villa in the evening and were pleasantly surprised to find that the villa had been stocked up with bread, butter, jam, beer, orange juice and wine. For us with three small hungry children was absolutely brilliant we could make them some toast and give them a juice! We found cleaning products as well as coffee etc it really was more than we were expecting!! The villa itself is absolutely stunning, bedrooms with loads of storage and the bed itself was very comfortable! I was a bit worried our children wouldn't be able to stand in the pool however, I was wrong. The pool is absolutely fantastic, they played on the stairs and 2/3 of the pool was shallow enough for them to swim around! Plenty of sunloungers and parasols as well as a big wooden table outside perfect for morning coffee and your evening dinner! Really couldn't fault the villa at all!! Have already recommended to several people to book through Jane, the service was fantastic! Quick, easy and only an email away!! We will most definitely book through Jane's Cyprus Property again!! Dear Siobhan, thank you for such a lovely review we are so glad you all enjoyed your stay at Villa Luna and welcome you all back at any time in the future! Kind regards Jane's Exclusive Cyprus Properties. A comfortable villa in a good, convenient location and nice a nd quiet. Good customer service from the manager to deal with minor queries even brought us a teapot within a couple of hours of request ! The only downside was that toilet tissue could not be flushed but placed in a bin. Outside space very good, sun nearly all day and sun loungers very comfortable. The villa is situated 10 minutes drive to Mandria beach, 15 minutes to Pissouri beach and the Rock of Aphrodite, 20 minutes from Paphos beach and 45 minutes from the Coral Bay beach. Avdimou & Kourion beaches also lovely just 20-30 mins drive. Along the route that leads from Secret Valley to Limassol the roadway opens up to reveal a magnificent stretch of coastline where can be seen chalky white hills standing watch over a dazzling aquamarine sea. Kouklia is the nearest village 5 minutes drive, with lovely quiet tavernas. Aphrodite hills resort is located within a 5 minute drive of the villa. Paphos town centre approximately 12 minute drive. Nearest airport: Paphos International at 12 kilometres. Nearest ferry: Paphos Harbour at 20 kilometres -14 mins drive. Nearest motorway: Paphos - Limassol at 50 kilometres. Nearest beach: beach The Cove 5 mins drive. Secret Valley lies 12km east of Paphos Airport and 1km from the motorway junction. Paphos Town is the main shopping centre with numerous shops & facilities. Pithari Tavern offers guests the opportunity to taste authentic island cookery and serves traditional tavern –type food in either the meze or the a la carte variation. The menu consists of a variety of Greek and Cypriot meat and fish dishes prepared in accordance with authentic recipes. Anoi Pub and Bar serves a large variety of draft and bottled beers, a new world wine list and quality fast-food favourites from potato skins and steaks to fajitas and spicy chicken wings, mozzarella dips and chicken wings, quickly prepared steaks, ribs and some traditional Mexican food like fajitas and traditional juicy hamburgers. Desserts, ice creams and smoothies are also available. Zimi Pizza and pasta is a traditional over the counter restaurant with a great variety of freshly made pizzas and calzones, oven-baked pasta dishes and pasta classics prepared to order and a fresh salad bar for quick service. Platia Coffee Shop-Ouzerie is a truly traditional Cypriot coffee shop serving coffee made in the utzaki and served with lizos, the traditional Paphos delights. The coffee shop also serves traditional Middle Eastern and preserved sweets, a variety of olive and cheese pies (Cyprus and Greek style) and other local puff pastry specialities. Gefsis Gelateria and Creperie serves top quality Haagen Dazs ice cream, served in home made cones of difference flavours, either for seated consumption or sealed and taken away. Confectionery creations are also prepared along with ice cream serving such as pancakes, Belgian crepes and waffles, complete with a variety of tantalising toppings. A visit to The Retreat Spa at Aphrodite Hills is the ultimate in top-to-toe pampering for body and mind. It offers a cool serenity with monastic interior and tranquil surroundings where superb facilities and an expert team of therapists tend to your every need. Changeover Day: Can be flexible please email for up to date availability. Notes on prices: Prices quotes are GB Sterling.